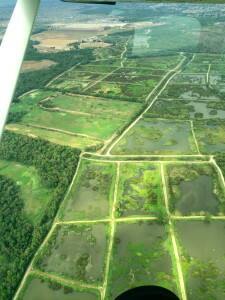 What I Learned Today » Flying to Flabob with a friend! Flying to Flabob with a friend! Today I got to fly with another pilot, Sara. We’ve been trying to get out to Hemet-Ryan for weeks, but the weather just won’t cooperate. Yet again, today, the clouds were too low to make that possible. However, we were able to fly out to Flabob (KRIR) and Corona (KAJO). I took the helm to fly us out to Flabob. The ceiling was reported around 3500-4600 AGL, but when we got up it seemed a bit lower than that. I settled on 2800′ MSL. SoCal directed us around some traffic, and we got a smattering of rain, but we had a nice view while flying east. Flabob is certainly a challenging place to land. 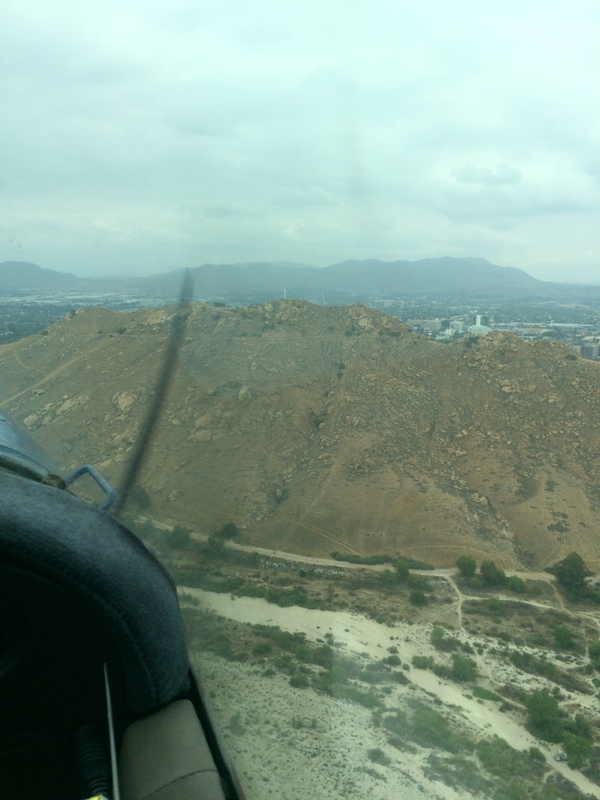 There’s a big hill/mountain (Mount Rubidoux) that squats just southeast of the runway, right about where you want to be when you’re getting ready to land on runway 24. This biases you towards turning (left) base a bit early. I ended up coming in high on my first attempt to land and doing a go-around. The second time worked out fine, but it takes some mental effort to intentionally fly at a mountain at 80 mph. When it was Sara’s turn, she figured out that by flying a diagonal base leg you can avoid the mountain yet still get a longer, more normal final approach. Brilliant! At Flabob, we stopped and switched pilots. Sara got in, did a loop around the pattern, and then flew us to Corona. We got a transition through Riverside’s airspace and then cruised over to Corona, whose runway is the same length as Flabob’s but in rather nicer condition, and much wider. There are some beautiful marshlands north of Corona where birds nest. After landing at Corona, Sara took off again and we got a transition from Chino airport and then flight following to head back to El Monte. Spotting El Monte was difficult due to the low clouds and grey sky, but we got in just fine. Overall, several great landings by Sara! It was really great to fly with another pilot! We helped each other out with radio communications, double-checking frequencies, and discussing airport approach strategies. Sara has a lot more experience than I do, and I can learn a lot from her (already got some great tips)! Below is the track of our flight, starting from El Monte on the left and heading to Flabob (KRIR), then Corona (KAJO), then back to El Monte. That makes 9 out of 26 L.A. airports for me! LOVE the word “squat” for Mt. R! That’s what it does! I actually landed at KRIR at the end of that pattern. :-) so cool you did the track, thanks ! Really fun flying w you we will do it again! PS: your go around was super helpful! I should’ve done my first time there to learn the environment ! Yes it does take nerve to fly right at a mountain! We did it!